The burden of diabetes weighs far more heavily on New Mexicans than on most Americans. Forty percent of the state’s residents suffer from the full-blown disease – or its precursor, prediabetes – and many of them are at risk for retinopathy, a leading cause of blindness. 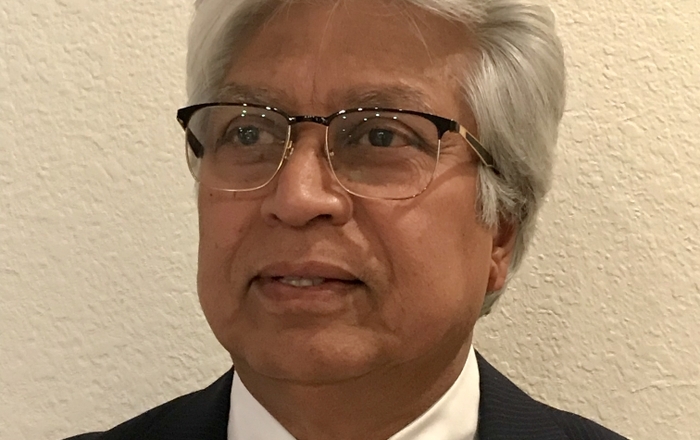 UNM’s Arup Das, MD, PhD, Regent’s Professor in the Division of Ophthalmology, and his long-time collaborator, Paul McGuire, PhD, a professor in the Department of Cell Biology and Physiology, will share in a five-year, $2.8 million grant from the National Eye Institute to explore the genetic differences that make some diabetes patients more likely to experience retinopathy – and who is most likely to benefit from existing treatments. “This study will show us if there’s a genetic factor that explains who responds well to the drugs and who doesn’t,” says Das, who is the grant’s principal investigator. He and McGuire hope that their research will yield insights that lead to more effective medications. New Mexico has 241,000 diabetics – 14 percent of the population, Das says. Another 600,000 have prediabetes, and the disease costs the state about $2 billion a year in medical expenses and lost productivity. Das estimates that 35 to 45 percent of diabetic patients have retinopathy and related blindness – and many of them come to him for treatment. Retinopathy – a condition in which the light-sensing tissue at the back of the eye deteriorates – is highly unpredictable. It’s an inflammatory process that starts with swelling called macular edema and then progresses to the point where new blood vessels sprout and start hemorrhaging, causing retinal detachment. Many diabetics will not develop progressive diabetic retinopathy during their lifetime, Das says, pointing out that some patients might have diabetes for 30 years with no vision loss. The Diabetic Retinopathy Genetics Study is a multi-center, multi-ethnic grant that also includes the Translational Genomics Research Institute, a Phoenix-based organization that conducts genomic research, and the Joslin Diabetes Center, a Harvard-affiliated group in Boston, McGuire says. The UNM and Joslin teams will collect DNA samples and medical histories from diabetic patients, while the Phoenix researchers will conduct genomic sequencing,” he says. New Mexico residents living with diabetes who wish to participate in the Diabetic Retinopathy Genetics Study may contact Dr. Arup Das at adas@salud.unm.edu. The eyes, it is said, are the windows to the soul, but for a team of UNM School of Medicine researchers they also hold clues to a cure for a devastating disease called diabetic retinopathy. 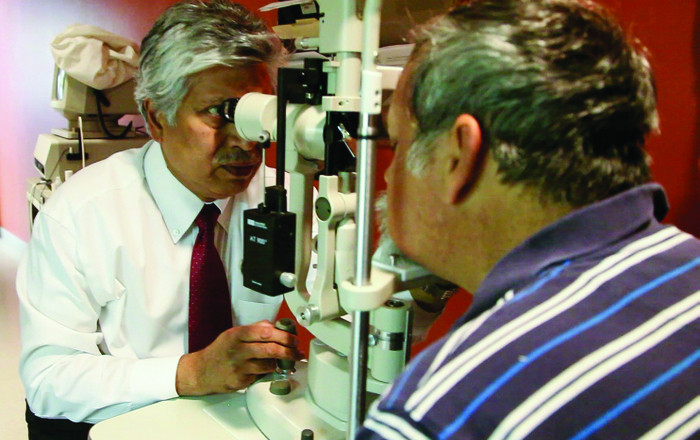 Diagnosed with diabetes in 1995, Leo Gonzales moved to Albuquerque from Roswell a year ago to be close to UNM Chief ophthalmologist Dr. Arup Das for monthly eye treatments. He couldn’t have placed himself in better hands. 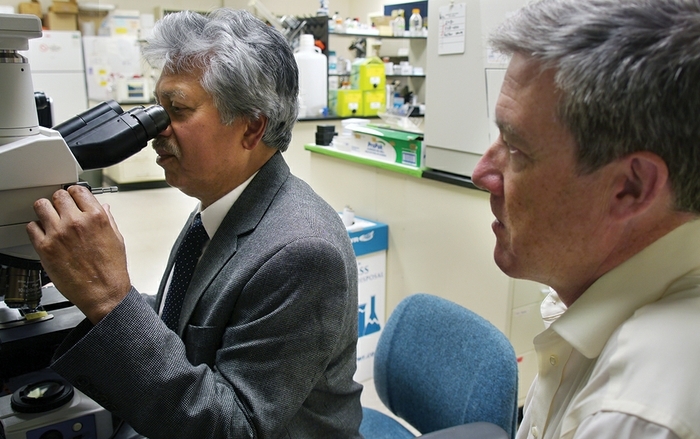 Das and basic scientist Dr. Paul McGuire are partnering to find a cure for blindness caused by diabetic retinopathy, which threatens the 19.7 million Americans (and 150,000 New Mexicans) living with diabetes.